March was another busy month for options trading. 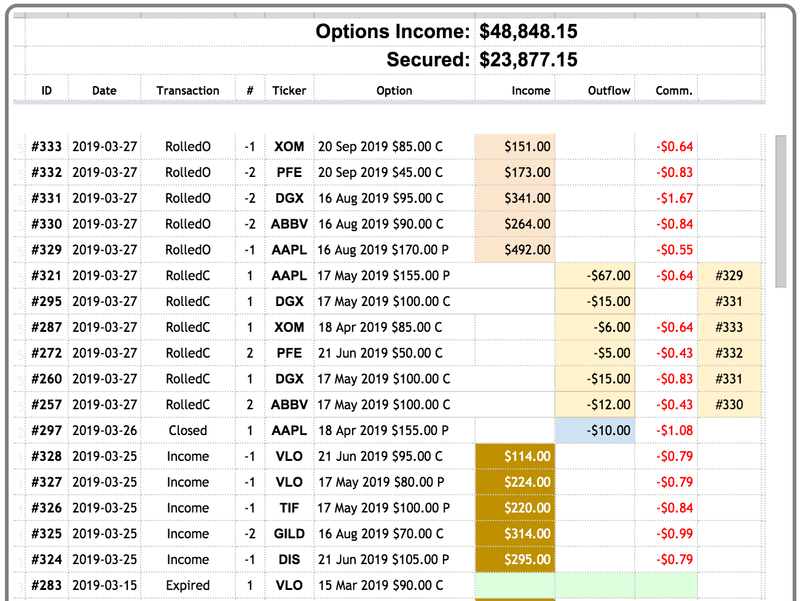 I collected nearly $2,500 in options income this month and I'm happy to report that I'm now ahead of pace as far as my options income goal for 2019 is concerned. As usual, this article will cover options transactions I executed this month, and I'll summarize the options that will expire in April and May. I'll conclude with the usual running tally of options income received versus options income secured. I made up lost ground in February by selling several covered calls and put options, and rolling some options forward as well. March was another busy options trading month, with one expiration, two covered calls, three secured puts, a few transactions in which I closed or rolled forward options. After no fewer than four assignments in February, I'm happy to say there were no assignments in March. On 15 March, Valero Energy (VLO) closed at $85.08 per share, below the $90 strike price of the January calls I'd sold. So the calls expired and I no longer have the obligation to sell 100 VLO shares. I secured options income of $164 with this trade. On 26 March, Apple (AAPL) traded around $186 per share. The $155 put I'd sold was deep out of the money and I decided to buy back the put. Closing the option early secured 98% of the available options income. The trade netted $796.82. With Exxon Mobil (XOM) trading just above $80 on 27 March, the covered call I'd sold on XOM was out of the money. I decided to roll forward the option to September 2019 and earn extra income. Doing so secured $118 in options income and I collected another $150 for selling the September $80 call. Also on 27 March, Pfizer (PFE) trade at around $42 per share, significantly below the $50 strike price of the June calls I'd sold. I decided to roll forward the covered call to September and simultaneously to lower the strike price to $45. This secured $148 in options income and I collected another $172 for selling the September calls. Quest Diagnostics (DGX) traded below $89 per share on 27 March, making the May $100 calls I'd sold deep out of the money. I decided to roll forward the options to August, simultaneously lowering the strike price to $95. I secured $165 in options income and collected another $339 for selling the August calls. AbbVie (ABBV)'s share price dropped below $80 on 27 March, so I decided to roll forward my May $100 covered calls to August, simultaneously lowering the strike price to $90. Doing so secured $486 in options income and I added another $263 to DivGro's options income tally. Finally, on 27 March, I decided to roll forward my put option on Apple (AAPL) and simultaneously to increase the strike price to $170. The trade netted $101 in secured options income and I received $491 for selling the $170 put expiring on 16 August 2019. This covered call yields 1.78%, or 7.40% on an annualized basis. The yield on cost of my VLO position is 5.67%, so I'm boosting dividend income by a factor of 1.31. If the option is exercised, I'll sell 100 shares of VLO at a reduced cost basis of $62.39 per share, for capital gains of 52.26%. This covered call yields 2.22%, or 5.62% on an annualized basis. The yield on cost of my GILD position is 3.57%, so I'm boosting dividend income by a factor of 1.58. If the options are exercised, I'll sell 200 shares of GILD at a reduced cost basis of $69.07 per share, for capital gains of 1.35%. For covered calls, I think an achievable goal is to earn double the dividend yield. Unfortunately, neither of these covered call trade achieves this goal. I'm satisfied that I'll collect capital gains should these call options be exercised. This put option trade yields 2.61%, or 18.00% on an annualized basis. At $85.48 per share, VLO yields 4.21%, so I'm boosting dividend income by a factor of 4.27. If the option is exercised, I'll buy 100 shares at a cost basis of $77.75 per share, a discount of 9.04%. This put option trade yields 2.13%, or 14.69% on an annualized basis. At $102.80 per share, TIF yields 2.14%, so I'm boosting dividend income by a factor of 6.87. If the option is exercised, I'll buy 100 shares at a cost basis of $97.79 per share, a discount of 4.87%. This put option trade yields 2.73%, or 11.33% on an annualized basis. At $107.79 per share, DIS yields 1.63%, so I'm boosting dividend income by a factor of 6.94. If the option is exercised, I'll buy 100 shares at a cost basis of $102.04 per share, a discount of 5.33%. For selling puts, I like to see a dividend boost factor of 5.00 or more unless I can buy shares at a discount of at least 10%.Two of these put options trades achieve my boost factor goal, while the third just misses the discount target with potential return of 9%. A few options are out of the money with small margins of safety, so I'll have to monitor these carefully as the options expiration dates approach. My options goal in 2019 is to collect a total of $21,000 or an average of $1,750 per month. I collected options income of $2,444 in March, for a year to date total of $6,055. This averages over $2,000 per month, so I'm now ahead of pace for 2019! While my options income does not yet match DivGro's dividend income, I'm hoping that will happen in the future. 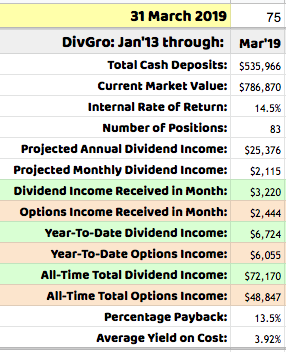 After 75 months of dividend growth investment, DivGro's all-time total dividend income stands at $72,170, whereas my all-time total options income is $48,847 after less than three years of options trading. My income goals for 2019 are to collect $25,200 in dividend income and $21,000 in options income. Quarter-ending months (like March) are huge dividend income months, so my year to date dividend income got a nice boost this month. Thanks FerdiS for the update. Hope I am not getting too personal but, what type of account do you trade options in? Tax deferred vs. Non deferred? I have an unorganized mixture of both and was thinking that I would be better off trading options in my tax deferred account while keeping qualified dividends in taxable account in order to capture the favored tax treatment. Would that be logical? But do you actually make money with it? Where can I find Options trading for income for dummies? Hi, MikeS -- thanks for your comment. My options trading is done in a taxable, margin account at Interactive Brokers. My IRA's are at Folio Investing, which does not offer options trading. I have not really considered the pros and cons of trading options in tax deferred accounts. I sell covered calls on dividend paying stocks I own, so I need to do both in the same account. Some people don't like selling covered calls because they see the potential assignment of calls as a negative event. I don't. The premiums more than compensates for the one dividend you may be missing out on. And usually, I can replace the (overvalued) dividend stock with one that is undervalued and with more upside potential. It looks like you've been busy. Congrats on the profits from the AAPL puts. I was a little over-extended in December and came close to a margin call. I'm trying to deleverage mine a little in case we see another correction. So far it's been fun and has generated a lot of income though. Thanks for posting the update. You're welcome, AAI -- thanks for visiting and commenting. AAPL is a great stock for put option selling, provided you can take on the risk of paying close to $20,000 if the put is assigned. A margin call is scary, so I'm glad that didn't happen. You're probably fine now since the market has recovered nicely. I'm slowly improving my portfolio's risk profile, and I have many covered calls at levels that I'd be happy to sell at. I'm hoping some of these assignments happen, as I want to go to a larger cash position by the end of this year.